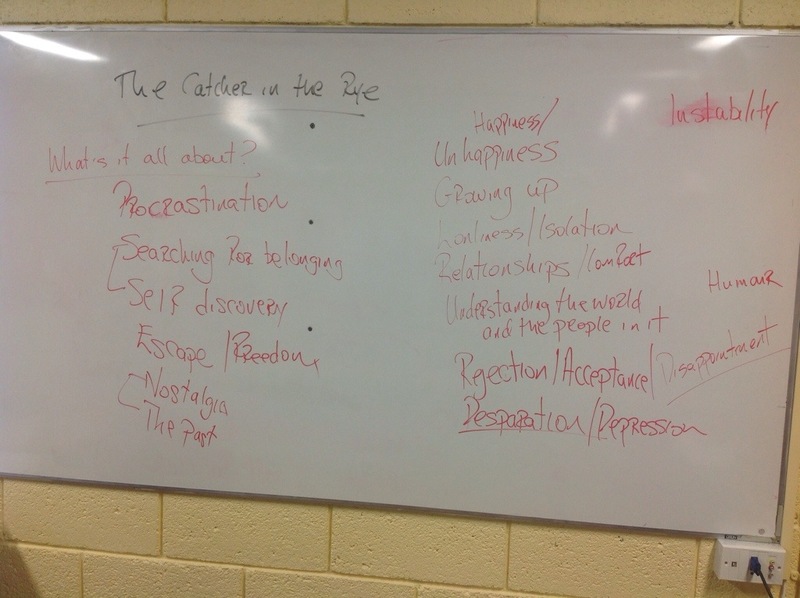 This started as some self-reflection and planning for my Leaving Certificate English teaching. It’s an interesting exercise, to try to write down everything, or almost everything we do, and it takes ages! There may be something you can use here for your own class, or you may think I’m way off the mark, but here it is. First we* take a look at the weekly timetable and break up the week. We make one day for Poetry and one day for Language. They also help as a constant: if it’s Monday it must be poetry! The other three are Reading days. On the dedicated Poetry day, we read one poem a week, six poems, with biography at the beginning and an overall exercise to finish. This might not sound like a lot of time on each poem but it works. It means I need to know everything I can about the poems, in case of questions, and I need to draw in the poem from the previous week to build an picture of the poets work. (This is a type of Comparative exercise too, comparing poems as texts). At the end of each class I set an exercise and they build up a collection of these which we discuss before they write a piece of their own. I don’t give notes though. They’ve got to listen, write and contribute to make the poems come alive, not everybody likes it, but everyone has to think or sink. I like to read four poets’ work in 5th Year. On the dedicated Language day (or Paper One day as it’s called), we begin with some basics around how a paragraph works. We look at the marking scheme very early on and very briefly to see how their papers will be marked and we always do a marking exercise with an exemplar (usually from the Examiner’s Report, or something I’ve copied from a previous year) for homework. This is always fun. I keep a file of things I’ve read that we can use and I’m turning more to Instapaper to keep some track on these. For example I have two reviews of the same restaurant which are wildly different (an unavailable online, sorry), I use them to teach language and register as well as how to include, or exclude, readers in your audience. The latest and greatest innovation on Language day is our blog. Each week someone is given the job of writing something either from an exercise or topic that we’ve been talking about or something that’s been on their minds. I read the post to the class on the day and they’re a great source of pride for the writer and inspiration for the students who have still to write. These posts are not marked. I insist on this because the Leaving Cert student is over-marked today, marked into oblivion. It’s good to have a place where they can escape this constant judgement and still know they’re doing something that helps their writing. It keeps the writing steady and helps us ‘build from the back’, writing more as the months go on. And everything they write counts. The students have access to the blog from home so they can log on themselves. We have a class gmail account and that’s useful for Google Docs too, more on that later. On the Reading days in Fifth Year we read all the texts with the fewest pauses necessary. We do this because we can read them straight through for pleasure, not study. When we’re finished reading them we spend a class or two talking about them and do an exercise called ‘What’s it all about?’ which is really about drawing out some general ideas on themes we can see or motifs we liked. It goes on the whiteboard and we photograph it. Comparative choice should be up to students to a point, I chose the single text always, but the girls chose at least one comparative text. Often it’s the movie. We always do a movie. It fast, it’s something with which most teenagers have a language fluency and you can see three easily if you’re being very strict about your planning. By the time we’ve read and settled on the three Comparative texts (a play, a novel,a movie) , we can start to find similarities between them. 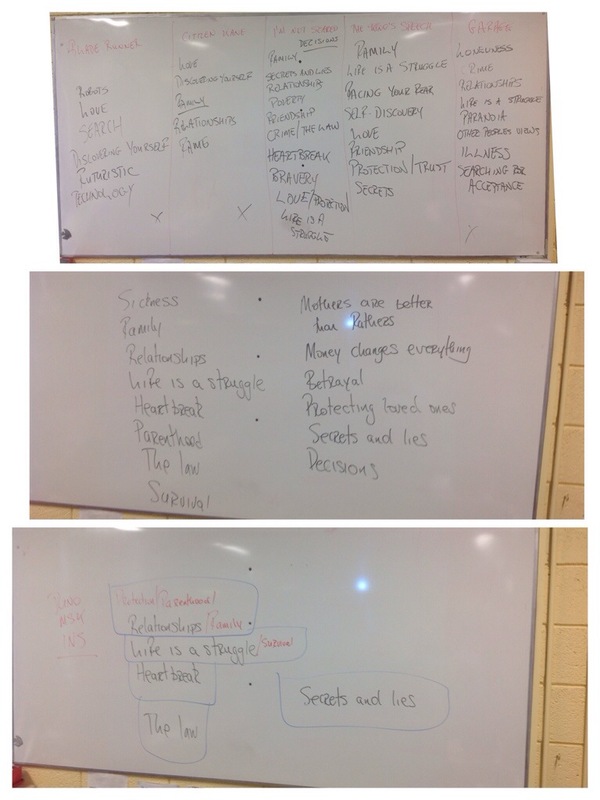 Here’s an example where we were still deciding which texts we’d include and the rough comparative exercise helped us chose. This is an Ordinary Level group where we were still deciding which movie to settle on and we’d chosen Juno and the Paycock and My Sister’s Keeper so fitting a movie with them was the exercise. I exert only minor influence on this whole process and it pays off when you can get a long conversation about ‘mothers vs fathers’ in the texts before they’ve even begun to think about Comparative Language. If we’re lucky we might have performed or seen the play in Transition Year if I’ve got my act together! But the picture doesn’t capture the discussion about what goes in an what we need to, sometimes reluctantly, drop. It’s my job to keep the Comparative Modes in mind, or to fit the sentence with the modes later. I always mark to the standard scheme, it’s a laborious task, and I’m very slow but I’m trying to improve! I sometimes hold on to work so I can return it when it serves a purpose, I might hold on to an initial response to a poets work and return it when we’re revising so the student can see the progress they’ve made or not made. The reason it takes ages it because good feedback is so important and I need to think about that and tailor it to the student. Without feedback, there’s no improvement, that’s all. 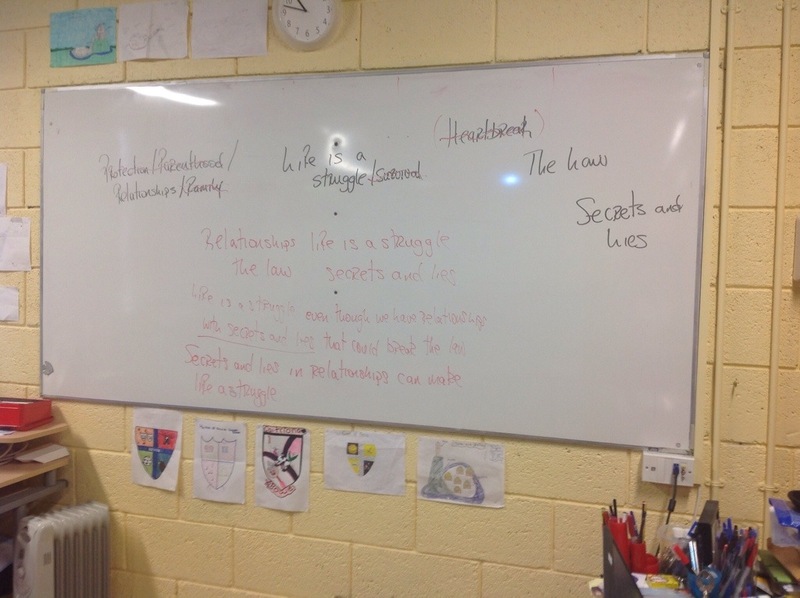 The Reading classes are used to read the Single Text in 5th Year too. The first reading again is for enjoyment, there’ll be less enjoyment later, but I think we should try to enjoy one Shakespeare text before we pass out of Secondary School! in 6th Year we use a double class (we’re lucky with the timetable in that we get an extra period in 6th Year) to read it for depth. It’s always a Shakespeare play, that’s a decision we made a long time ago and makes ordering books easier (we have a book rental scheme in our school). After reading it and probably seeing it on film in 5th Year we return to it for a close reading. I introduce character study and maybe a key theme at that stage. I like to have it read a second time by November. The third reading isn’t strictly chronological because we’ll cover characters, themes and motifs in more detail. All of this depends on which play we’re doing: Macbeth we can motor through, with Hamlet we have to take more care. It’s always better to get to see the play performed, but if it’s not possible, we try to see at least two if not three versions on film. YouTube clips can be great for character study and I put some of them up on the blog too. 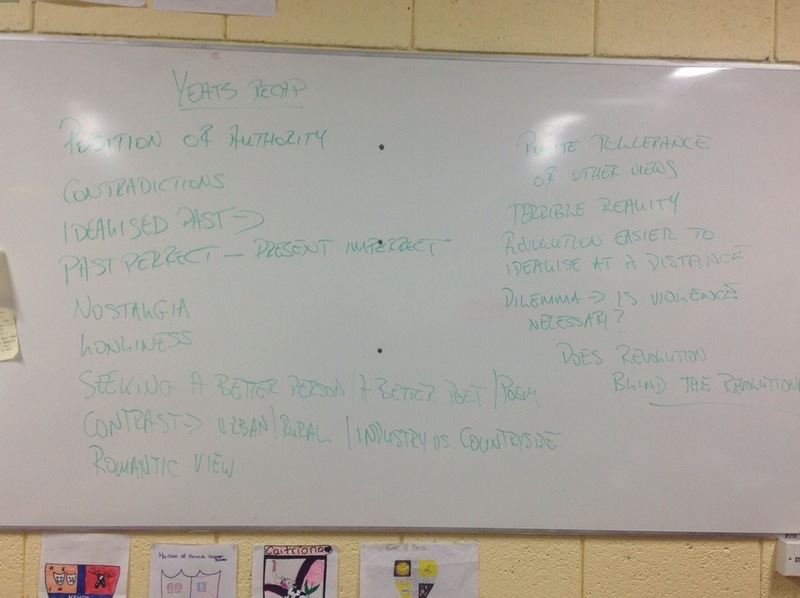 When we reread the a Comparative texts in 6th Year we have that comparative sentence in mind, but now we’re search for key moments so it’s a closer reading. Each student has a list of key moments of her own, we can write better from our own work, I don’t provide a set list, it’s not my study, it’s personal to them. This almost always works, if the students are listening and contributing, but that’s teaching all over isn’t it? This is what I do, and it works for me and (most of) my students but what I haven’t been able to put in here is how building a bond between teacher and student is crucial. I miss my classes when they’re finished, no doubt they don’t miss me but all of the above falls flat if you don’t include the students, give them a voice and make sure they’re comfortable expressing an opinion. I got very little chance to do that in school, my students will get every chance. * It’s almost always we, hardly ever they or I, we’re in this together.